Around the country, problem ants, often originally from other countries, continue to invade new areas. Crazy ants, trap jaw ants, white footed ants, fire ants, Argentine ants, and Pharaoh ants are just a few of the many ants species that are gradually spreading. These and other prolific ant species are one of the reasons ants have become our nations #1 pest. Because unprotected homes experience repeated and persistent ant invasions each year, new clients call more often to control invading ants that any other pest. Ant colonies are humming with activity at this time of year! There is an abundance of food, and colonies are growing in numbers, with queen ants laying dozens of eggs day in and out. At various times ants wander indoors, searching for food, moisture, or a better nesting site. If they find what they are looking for, expect more ants to follow-often hundreds or even thousands of ants within an hour of the original discovery. Outdoors, an abundant food eaten by many kinds of ants is honeydew. What is honeydew? It is a sugary substance excreted by aphids, white flies, and many other plant-sucking insects. 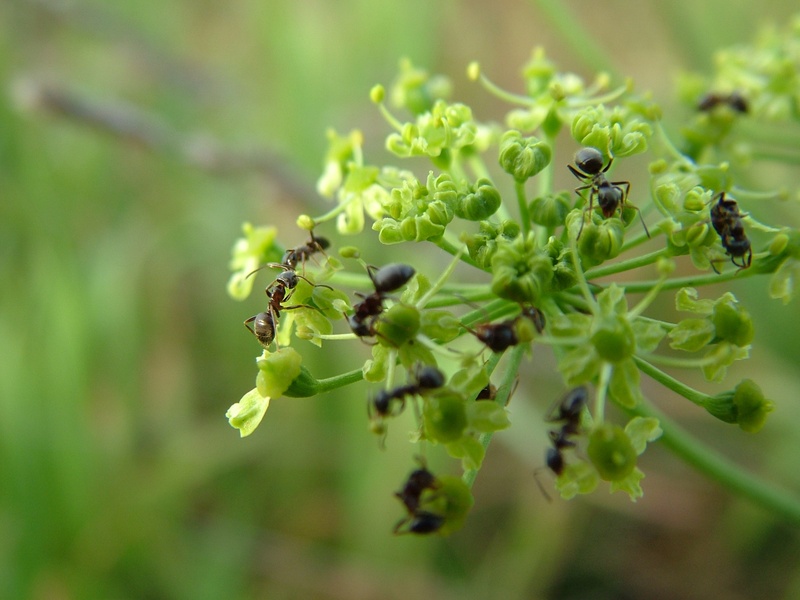 Ants love honeydew so much that some species actually tend and protect the aphids and other pest that produce it, and will even carry aphids to new plants. Ants are pests that almost continually try to invade homes, and require professional treatments to keep them out. If you or someone you know is having problems with ants, call us-we are the area ant experts! No one knowingly hangs a sign on their door saying "Termites Welcome Here" But unfortunately most homes have one or more conditions that practically beg any termite in the area to invade. On of those "welcome signs" for termites is excess moisture in the structure, a condition that attracts termites and many other wood destroying pests. This is a common problem-one study found that an amazing 88% of all homes have one or more moisture problems! Some common moisture problems found are: Improperly drained downspouts and air conditioners, leaks in the roof or gutters, poor drainage around the foundation, and sprinklers spraying water onto the side of homes. Fix these today-don't invite termites to move in and eat your home! Remove pieces of wood, as well as dead roots and cardboard buried or laying on top of the soil. Also remove tree stumps. Make sure no wood in is in direct contact with the soil. Termites often invade wooden fences, trellises, and flower planters that are touching soil, and then use these as hidden highways to enter your home. Do not allow shrubs or vines to block any air vents. Finally, be sure to have us professionally inspect all potential termite problem areas on a regular basis (if we are not already doing this for you), and treat if needed to prevent or stop and infestations. We often save our customers thousands of dollars by either preventing or stopping early an infestation of wood-destroying pests. All year, but especially during the summer, outdoor lights attract millions of flying and crawling pests, as well as spiders, ants and other pests that come to feast on whatever the lights draw in. A recent study compared outdoor residential lights in Virginia and found that some bulb types attracted far more pest than other bulbs. The standard incandescent bulb attracted the most pests, followed by CFL, halogen, cool color LED and an incandescent yellow "bug" light. The warm color LED bulb attracted the fewest pests of all the bulbs, so this would be a good choice for outdoor lighting. (a warm color LED was higher Kelvin rating than a cool color LED). Up until now the yellow "bug" light has been the recommended choice for outdoor lighting situations, but many people don't like the yellow color of the light. This study also found another disadvantage of the yellow "bug" lights-they attracted more earwigs ("pincer bugs") than all the other light bulbs, and more true bugs (such as stink bugs) than warm LED bulb. A cockroach-infested apartment exploded recently in New Jersey. It happened when the occupant, who was untrained and was using a household insecticide to try to kill cockroaches, began to experience a headache and opened a window. According to the firemen who responded, the explosion happened when the build up of trapped indoor fumes, combined with the additional oxygen from outside, was ignited by the stove pilot light. The two adults and toddler that lived in the apartment were taken to a hospital and unfortunately had no home to return to. But ironically the firemen who were called to the scene could still see live cockroaches crawling about! Folks, this kind of damage happens all the time. please leave pest control to trained professionals; this never happens with the products we use and the safety precautions we employ.